Last week I submitted my final assessments for my Master eLearning course through B Online Learning. It was somewhat bittersweet in that it meant that the course was coming to an end but at the same time I felt a sense of accomplishment now that I was finished. The third and final part of the course focused on facilitating in an online environment which is something that I haven’t done before. Part of what we did was to put together a 15 minute webinar and facilitate it with other students. I found this wasn’t as easy as it looks but a good learning experience nonetheless. I don’t have much online facilitation experience, I have however, been a student in a few online courses in the past and in my experience this is where they tend to fall down. There’s usually a lot of good resources to be found but not much in the way of involvement from the facilitator. This wasn’t the case in the MEC. In fact, one of the strengths of the course was our Learning Coach Ruth and it wasn’t so much what she taught in terms of content (which was good) but how she facilitated throughout the course. She set the example by being supportive, encouraging and providing regular updates and feedback. Even though there are quite a few people completing the course, there’s certainly a good level of personalisation and this is one of the things that sets the MEC apart from other online courses that I’ve completed. the need to keep developing your skills, there’s always something new to learn. I’d definitely recommend the MEC to anyone starting out in eLearning as it provides a solid foundation as to how much goes into creating an eLearning module or course. It would also be beneficial to anyone wanting to brush up on their skills. You do need to put in a fair bit of work into the course and manage your time but it’s definitely achievable even if you are working as well, you just need to pace yourself. My advice to anyone thinking of doing the MEC would be to commit some time each week to complete the work rather than leaving it until the end. You should also check out ‘Connect’ which is where you can share resources and make contact with other students. So while the journey of the MEC has come to an end, my own journey in the world of eLearning has a long way to go…. Oh, and by the way, I passed the course! Yay! This is the final in a series of posts describing and reflecting on my experiences of the Master eLearning Course by B Online Learning. It’s been several weeks since my last post about B Online Learning’s Master eLearning course that I’m working through. We’ve moved through the second module and covered chunking content, writing for eLearning, using simulations, interactivity, checking for understanding just to name a few. I can’t believe that we’re well over half-way time is moving so quickly. In this second stage of the course we were to develop a piece of eLearning that can be for use in your workplace if you want it to be. I’m not going down that path because I want to develop a sample for my portfolio of examples and to also tap into the expert guidance we have available during the course. While this will be beneficial for me, my brief is effectively “create a small piece of eLearning on any topic you choose” which is kind of daunting. 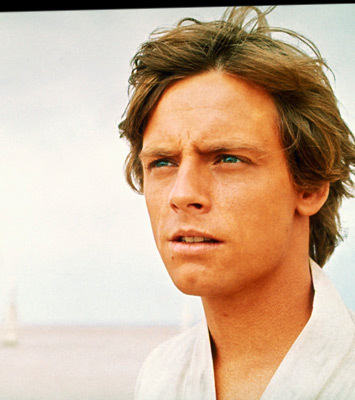 Along with the topic, I needed to create a bit of a backstory as well – learner characteristics etc. so, as I have an interest in craft beer and brewing so I thought I’d go with that and I might learn a bit more about the topic too. I also wanted to showcase some of what I can do in terms of design and use of Storyline. When I’m putting a module together I like to take a pen/pencil and write my ideas down on paper. I jot down random thoughts and think about how the module might look in terms of images, the theme of the course, anything really. 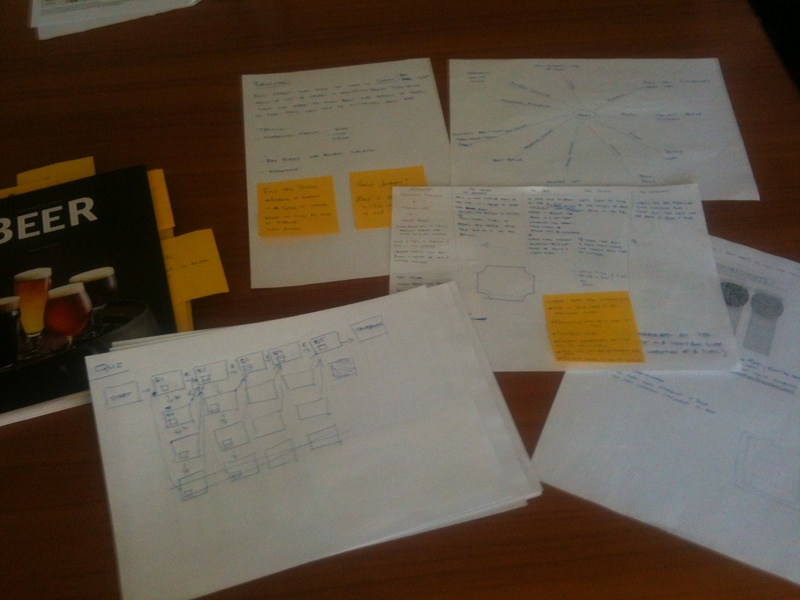 While it looks a bit messy, it does help me to clarify my thinking and get my ideas down. Once the storyboard was completed I sent it to Ruth for some feedback. What I liked about the feedback I received was that it was both positive and constructive. It was detailed for some screens and Ruth offered some great suggestions for improvement that I have since incorporated. This screen is my ‘Home’ page. 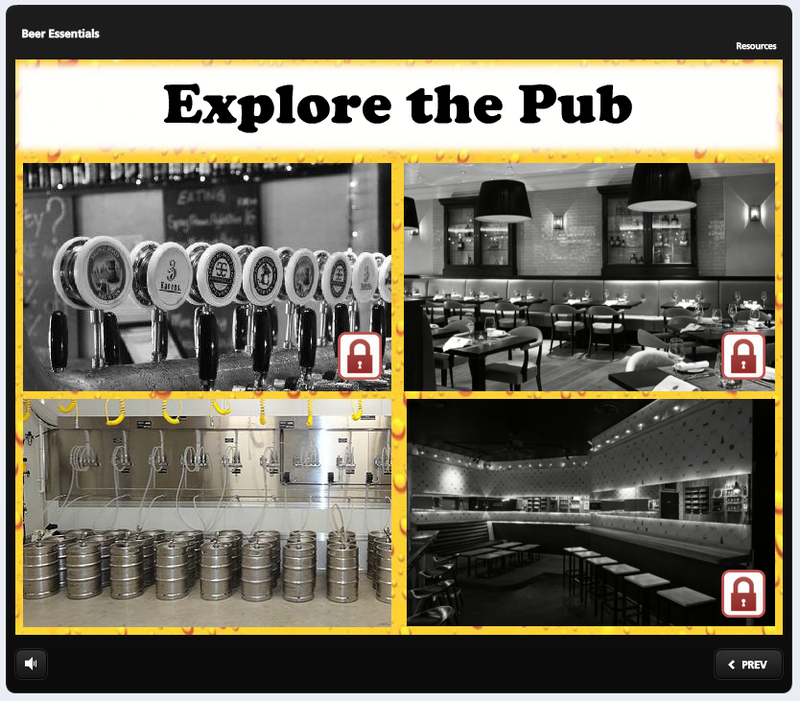 I have four topics, each is a different area of the pub that learners go to – The Cellar is about beer and brewing, The Bar is about pouring beer and using the right glass, The Lounge is about different beer styles and The Restaurant is about matching beer with food. Different areas unlock when other areas are completed. The quiz appears once all areas have been completed. 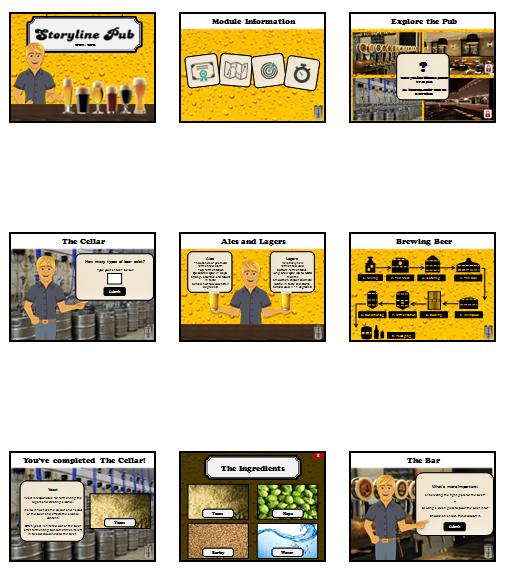 This screen depicts the brewing process and I’ve included it because each icon was made using the ‘Insert Shapes’ functionality in PowerPoint. 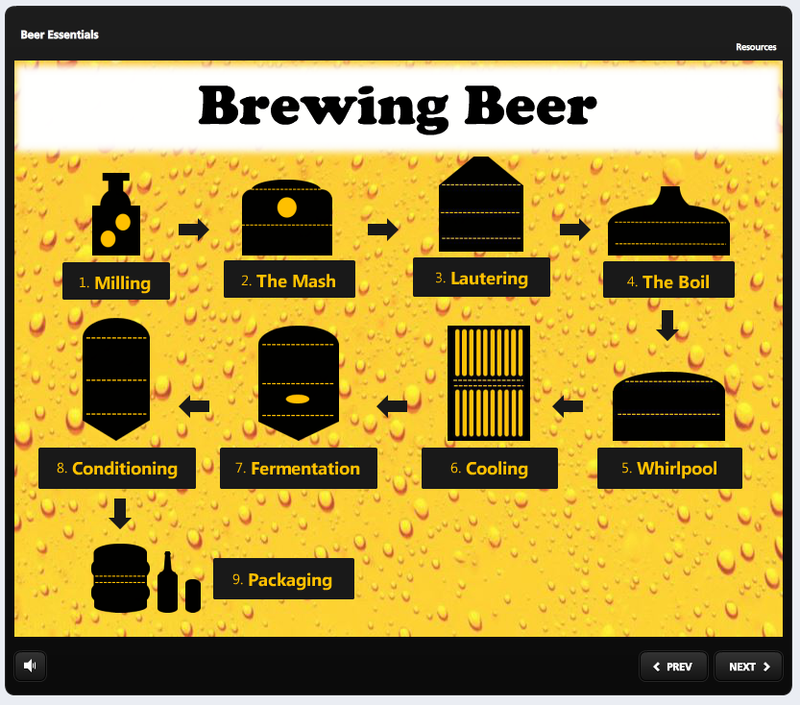 Learners hover their cursor over each icon to find out about that stage of the brewing process. 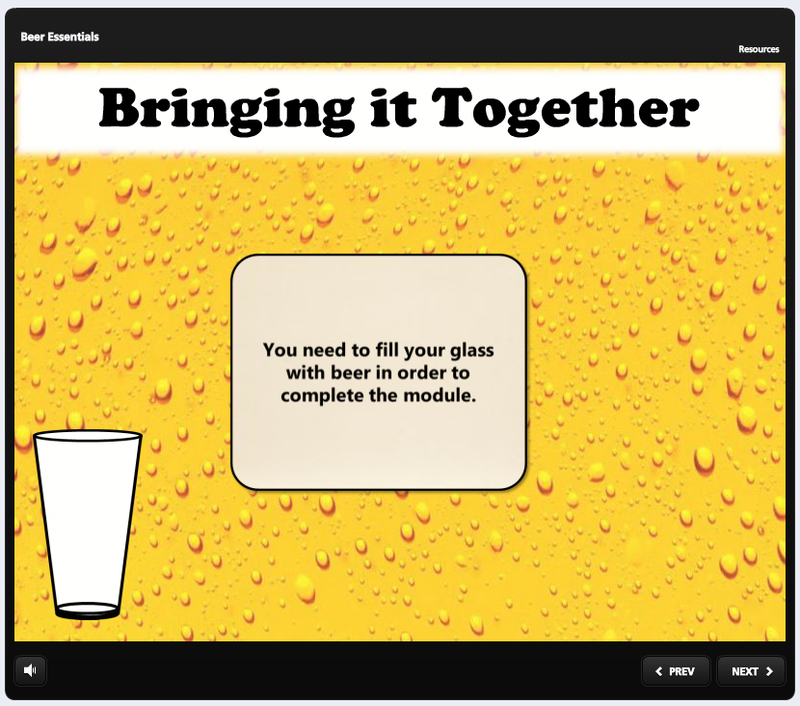 This screen is the opening of the ‘Quiz’ instead of having a pass mark, learners just need to fill their glass of beer and they can do this by answering questions correctly. A minimum of 10 questions will do it but if they do get a question wrong they receive a different question. If they get that one wrong they go back to the original question. In all there are 20 questions in total. In the MEC, like many other courses, you do need to be disciplined and allocate a few hours each week to work on the course otherwise it’s easy to fall behind. In addition to the assessment tasks there’s self-paced modules to complete and webinars to attend. While there’s plenty to do, Ruth’s weekly email updates are a good source of information and encouragement to help keep us on track. In the course itself, it’s good to see things picking up in the forum area ‘Connect’ as other people share articles and comment or ‘like’ others. As someone who uses twitter as part of my own development, it’s nice to be able to interact with others and hopefully encourage them to keep this going after the course has finished. I’m looking forward to the final stage of the course, where we will be learning how to facilitate in the online environment – something that I haven’t done much of at all. This is the second in a series of posts describing and reflecting on my experiences of the Master eLearning Course by B Online Learning. A couple of weeks ago, I began the Master eLearning Course (MEC) that is run by B Online Learning and over the next three months along with the rest of my cohort we will design, deliver and facilitate an eLearning course. I find that eLearning courses fall into one of two categories, either stand-alone modules developed in an authoring tool (which is usually what I create and develop) or ones like the MEC that are facilitated by a person, a Learning Coach in this case, over a period of weeks or months. I’ve had some experience of this type of facilitated online delivery as a participant and it has generally consisted of a list of resources to be read, activities to maybe complete and very little contact from the facilitator. However, this not how the MEC operates, the structure is clear and defined and the support has been terrific. Our group is also fortunate that our Learning Coach is Ruth McElhone who is very experienced in this form of design and delivery. She’s like the Obi-wan Kenobi of online facilitators (with Princess Leia looks) and by the end of the course I’m sure our group will become eLearning Jedi. 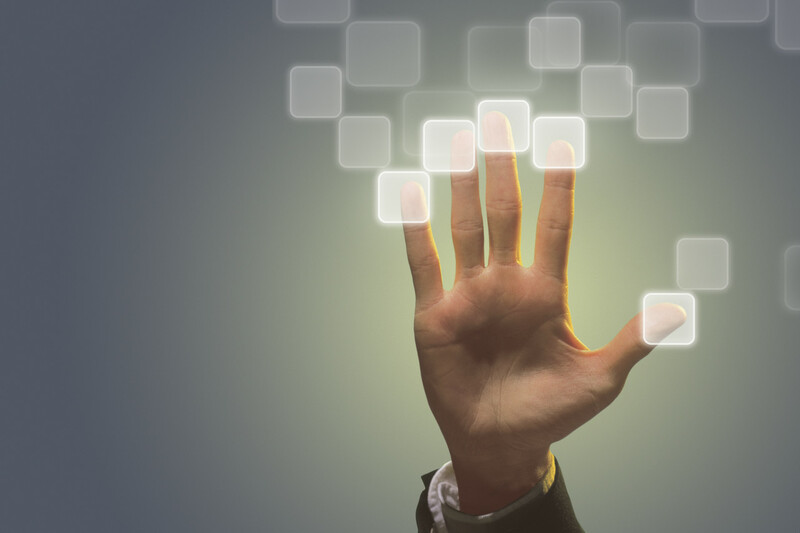 MEC combines the use of Articulate Storyline modules within the LearnFlex LMS that also has discussion forums and other places to interact and share with students via Connect. So far, there’s been a good amount of information delivered in a variety of ways. Interaction is encouraged and rewarded by using gamification to motivate us to reach ‘Contributor’ status. There are also plenty of resources to download and refer to later depending on what you want to learn more about. One of the strengths of MEC is that even though it’s mapped to two Units of Competence from the Vocational Education and Training (VET) sector, it doesn’t have the feeling that we are just working through the elements and performance criteria of each unit that you get from other VET courses. My initial thoughts are that it’s a great course for those who are new to the world of eLearning design and development. MEC lays a good foundation in these areas and while I do have some eLearning instructional design experience, I haven’t been bored and if anything it’s been a good refresher. I wish I had done this or something similar earlier in my eLearning career. Already in the first module of the course we’ve looked at rapid eLearning, scoping a project, stakeholders involved, copyright, health and safety, learner characteristics, accessibility, authoring tools, Learning Management Systems, SCORM and eLearning development teams. There’s a lot to take in but like any form of study you need to dedicate time and effort into learning and developing your knowledge and skills. It’s self-paced so you can complete the topics in your own time and as much or as little as you like. I believe that it’s also beneficial to get involved in the discussions and sharing with others in the group. Not because you have to as part of the course but because that’s what helps to build and sustain a community of professionals long after the course is finished. I’m looking forward to what the next few weeks have in store and as well as sharing the development of my own eLearning course. This is the first of a series of posts describing and reflecting on my experiences of the Master eLearning Course by B Online Learning. When I started working as an Instructional Designer a few years ago, I didn’t have much ID experience. In fact, I didn’t even realise that it was a career path! I’d been working as a classroom trainer up until that point and enjoying it but I wanted a change. Since becoming and ID I’ve had the opportunity to design for eLearning and classroom environments. Apart from a 2-day workshop, much of what I’ve learned along the way has come from my own experiences and from the experiences of others. From early on in my career I have wanted know more about instructional design and how to design to improve performance – two things that still drive me today. A few weeks ago I posted a list of what I called 20 Resources for New eLearning Professionals on the eLearning Industry website. It was my way of both acknowledging and sharing with others who are maybe in a similar place as I was and are looking for sources of practical and thought-provoking ideas in the fields of learning and design. I limited it to 20 just to keep it concise but now that it’s on my blog I thought I’d expand on it a bit. It would be great if you could add a couple in the comments area too. In just a couple of years, I have come across many of great practitioners in the learning field from trainers to instructional designers to those who specialise in a particular area and those who are more generalist L&D/OD in what they talk about. The one thing they have is common is a passion for what they do. My personal learning network has grown steadily and continues to grow and I wanted to share with you a few of the people who have had an impact on me in some way. The following people and resources provide excellent, relevant and useful information on a variety of e-learning areas and most also provide a means for you to connect with the other learning professionals, helping you to grow your own personal learning network (more about PLN’s in my next post). When I first started looking for information on instructional design, I started with books. Even in this digital age, I still love reading an actual book. A colleague recommended Ruth Colvin Clark and as such I’ve read several of her books. I find her books provide a straightforward, evidence-based approach and I’ve learned a lot from them. All these books are terrific resources as they provide in-depth coverage that is easy to read and apply to your professional and personal life. (I’ve also got Reality is Broken: Why Games Make Us Better and How They can Change the World by Jane McGonigal and Better than Bullet Points: Creating Engaging e-learning with PowerPoint by Jane Bozarth on order). I didn’t start reading blogs until I started my own blog earlier this year. I figured that the best way to learn about writing a blog is to start by looking at how others do it. What I discovered was a wonderful source of information, opinions and reflections (even writing styles) on a variety of areas within the learning field. I find blogs to be a great way to not only learn about what’s happening in the learning profession but to get some alternative viewpoints that may challenge your own ideas. I’ve listed a few that I read below and there are some more under the ‘Blogs I follow’ label to the right of the screen. Regardless of whose blog you read, if you find a post that interests you, chances are it will be interesting to someone else so why not share it by clicking on one or more of the share options at the end of the post. Tom Kuhlmann @tomkuhlmann – Tom writes the Rapid Elearning Blog where he shares great practical tips & tricks for building elearning courses. I realise that there’s a lot of names listed in this post but I believe they are worth checking out if you want to learn more about eLearning, instructional design, performance improvement and the role of L&D. Maybe not all at once but when or if you need to. They have helped me along the way and might help you too. It would be great if you could add a couple of (or more) resources that you have in the comments area below and also share this post. That way we can create a living blog post that will reach a wide audience. Finally, a huge THANK-YOU to everyone who has and continues to help me, challenge me, inspire me and share their knowledge; it’s very much appreciated. Every year globally, people spend huge amounts of money and time playing video games. Most people who engage in video game play choose to do so voluntarily, because it is fun and they enjoy it. This makes it an intrinsically motivating activity. Research into video game play has tended to focus on either the positive effects e.g. a sense of efficacy or improved learning or the negative effects e.g. lower productivity or violent tendencies on players1. However, some studies have examined the motivating effects of video games, albeit from different perspectives. Teamwork: collaborating with others, achieving as a group. Autonomy – the extent to which the game provides flexibility over movement and strategies, choice over task and goals, and rewards that provide feedback and not control. Competence – the extent to which tasks provide ongoing challenges and opportunities for feedback. Relatedness – the extent to which the game provides interactions between players. Intuitive controls – the extent to which the controls make sense and don’t interfere with feelings of presence, were also important as they allow players to focus on game play and access the need satisfaction provided by the game. Contexts that satisfy these basic needs will support people’s actions, resulting in more optimal motivation and positive outcomes. Therefore, we should design our eLearning experiences to support the autonomy, competence and relatedness needs of our learners. Gamification is a technique that aims to replicate the motivational pull of video game play and apply it to eLearning experiences. While gamification has been met with some criticism, it seems that it’s more the application that is the problem rather than the technique itself. In order to successfully gamify an eLearning course we need to satisfy people’s basic psychological needs. 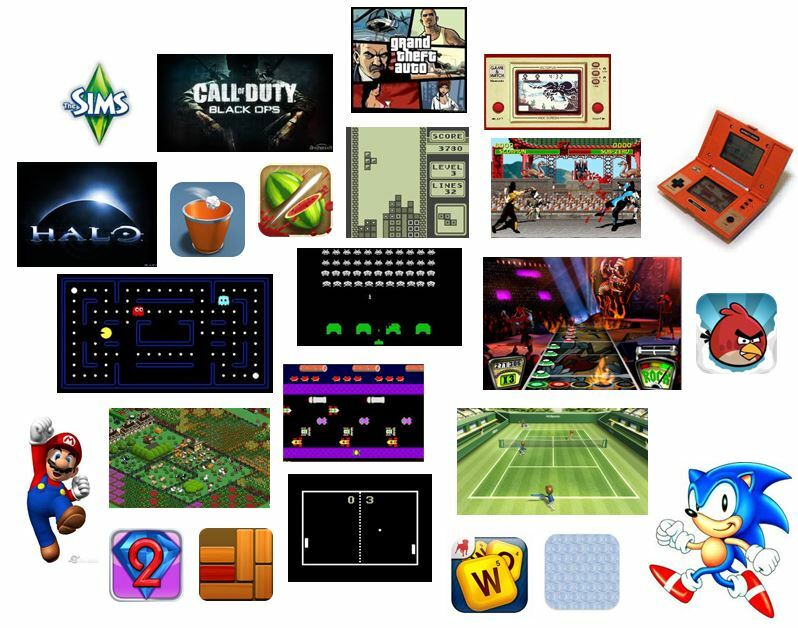 If we look at popular video games over time such as Sonic the Hedgehog, Super Mario, Angry Birds, Guitar Hero, Wii Sports, Donkey Kong, World of Warcraft or Space Invaders, we can see how they satisfy these needs and use similar approaches to our own eLearning design. Popular games use different combinations of game design elements in order to keep people motivated to play. 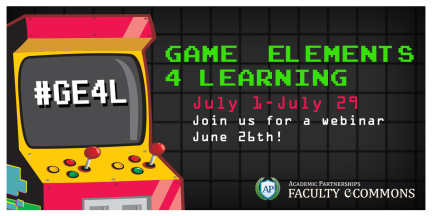 If you substitute ‘player’ with ‘learner’, from the above list, you will see how gamification can be incorporated into your eLearning experiences. Once the mechanics are selected (based on the needs of learners), designers can then look to incorporate the aesthetic elements of game design in order to create presence and intuitive control/navigation which will support the game mechanics. Motivation plays an important role during eLearning experiences and our challenge is to create eLearning that our learners want to engage in. While it does require more effort in the design, gamification is a technique that, if used correctly, can improve the motivation of all learners who experience gamified eLearning. 1 & 4 Ryan, R. M., Rigby, C. S & Przybylski, A. K., (2006). The motivational pull of video games: a self-determination theory approach. Motivation and Emotion. 30, 347-364. 2 Przybylski, A. K., Rigby, C. S. & Ryan, R. M. (2010) A motivational model of video game engagement. Review of General Psychology. 14 (2), 154-166. 3 Yee, N. (2006). Motivations for play in online games. CyberPsychology & Behaviour. 9 (6), 772-775. Teaching in the online environment is quite different from teaching in the classroom and as such has a number of unique characteristics and limitations. The following guide (based on my experience as an online facilitator and learner) is designed to help you before, during and after an online teaching event. Emphasise the importance of interactions and that online communication between participants is key to building community and contributes to the course outcomes, profiles, forums, chats etc. What are your tips for successful online course facilitation? My list of tips was originally posted on the eLearning Industry website a few weeks ago. It’s had over 4,600 views so I thought I’d post it here as well. For us to experience well-being, we need positive emotion in our lives. Any positive emotion like peace, gratitude, satisfaction, pleasure, inspiration, hope, curiosity, or love falls into this category – and the message is that it’s really important to enjoy yourself in the here and now, just as long as the other elements of PERMA are in place. When we’re truly engaged in a situation, task, or project, we experience a state of flow: time seems to stop, we lose our sense of self, and we concentrate intensely on the present. This feels really good! The more we experience this type of engagement, the more likely we are to experience well-being. As humans, we are “social beings,” and good relationships are core to our well-being. Time-and-again, we see that people who have meaningful, positive relationships with others are happier than those who do not. Relationships really do matter! Meaning comes from serving a cause bigger than ourselves. Whether this is a specific deity or religion, or a cause that helps humanity in some way, we all need meaning in our lives to have a sense of well-being. Many of us strive to better ourselves in some way, whether we’re seeking to master a skill, achieve a valuable goal, or win in some competitive event. As such, accomplishment is another important thing that contributes to our ability to flourish. For me, both of these provide some good considerations when designing a gamified learning experience. They also highlight the complex and multifaceted nature applying gamification in a meaningful way.